"God an Mary be wi us"
Coonty Mayo (Erse: Contae Mhaigh Eo) is ane o the twenty-sax coonties o the Republic o Ireland an ane o the thirty-twa coonties o Ireland. It is locatit in the province o Connacht. The coonty wis named efter the village o Mayo (frae Irish Maigh Eo, meanin 'plain of the yew trees'), which is now generally kent as Mayo Abbey. The population o the coonty is 123,839 according to the 2006 census. 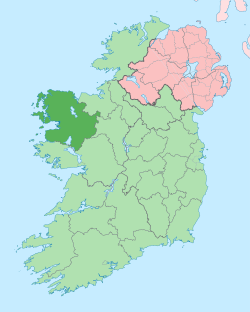 The coonty's main touns ar Castlebar an Ballina, respectively locatit in the centre an in the north east o the coonty. This page wis last eeditit on 8 Mairch 2013, at 22:14.